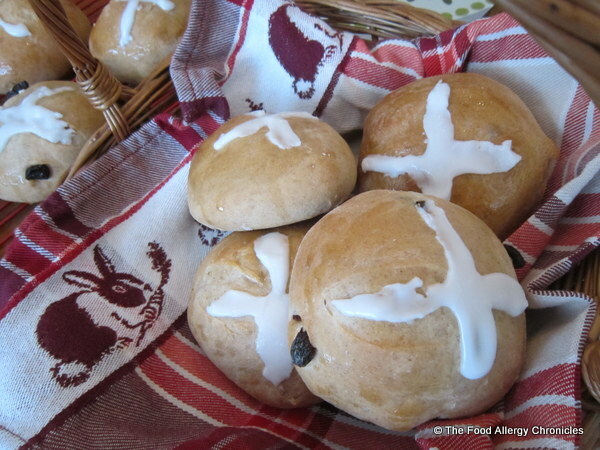 Posted on March 29, 2013 by Susan H.
Hot cross buns are traditionally enjoyed on Good Friday…therefore, I will be up early today with my breadmaker in order to have Dairy, Egg, Soy and Peanut/Tree Nut Free Hot Cross Buns fresh from the oven for my boys’ breakfast…perhaps brunch. Unable to purchase these delicious treats from a grocery store or bakery due to my boys’ combined food allergies…dairy, egg, sesame, peanut/tree nuts, lamb, beef, shellfish, fish, mustard and raspberry…I set out to adapt a recipe. I chose the Hot Cross Bun recipe from my from my well-used original Black & Decker All-In-One Deluxe Breadmaker Recipe Guide Book. This recipe was easily adapted, easy to make, easy to bake…and tasted great! Icing: 1/2 cup icing sugar mixed with 1/4 tsp pure vanilla and 2 tsp water…or until a desired consistency for piping a cross on top of the buns is reached. Measure all the ingredients in to the bread machine in order…minus the raisins. Select the Dough/Pasta Setting and press start. Add the raisin at the ‘Add ingredient’ beep. When the dough is complete…remove dough to a lightly floured surface…knead dough a few times. See tip below. Divide and shape dough in to 18 round pieces…I made 11. Place 2 inches apart on a parchment, silicone or greased baking sheet. Remove to cooling sheets and brush glaze over top of the buns. Cool on cooling sheets…pipe icing over top of the cut cross. Tip: As Matthew is not so fond of raisins and Michael wanted to have raisins…I did not add the raisins at the ‘Add ingredient’ beep. Instead, I divided the dough in half and kneaded in about 1/2 cup raisins into half of the dough. How will you be celebrating Easter Weekend? Have a ‘Hoppy Easter’! 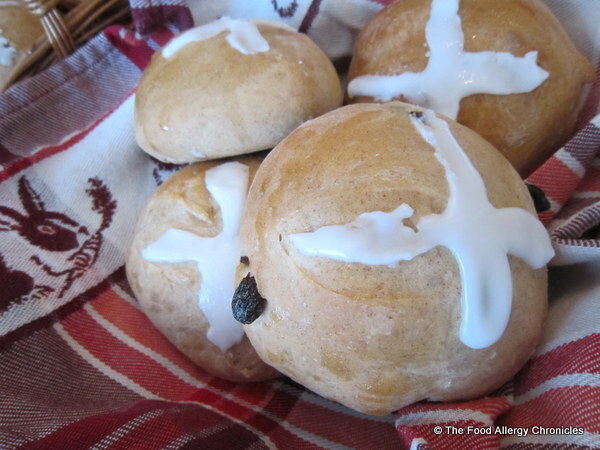 This entry was posted in allergies, baking, breads, breakfast, dairy free, Easter, egg free, multiple food allergies, peanut/tree nut free, soy free and tagged Black & Decker All-in-One Breadmaker, Dairy Egg Soy and Peanut/Tree Nut Free Hot Cross Buns, Natur-a Rice Beverage, Natur-a Soy Beverage by Susan H.. Bookmark the permalink.